Physician, chemist, writer and revolutionary: Benjamin Rush (1746-1813) was a remarkable man in a remarkable age. Arguably the greatest physician America had yet produced, he was an early and tireless advocate for vaccination, an authority on epidemic disease and wrote the first American textbook on mental health. He was also controversial: during a dreadful outbreak of yellow fever in Philadelphia in 1793 he adopted a regime of treatment which involved bleeding his patients “not only by ounces or in basins, but by pounds and by pailfuls”. 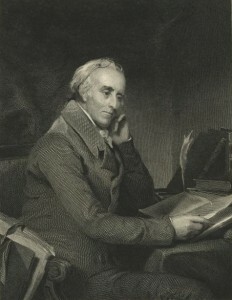 He became embroiled in a celebrated libel case with the English polemicist William Cobbett as a result. Rush was also a Founding Father of the United States – one of only five physicians who were among the signatories of the Declaration of Independence in July 1776. Ben Carson, a surgeon, is currently running for the Republication nomination for the US presidential election. I’ve written an article for The Lancet (my first!) about Benjamin Rush and other political physicians. You can read it here. It’s free to access, but you’ll need to register on the Lancet website in order to do so.